Long Islanders Nik Moronese and Marie LeBreton may not have taken a conventional path to becoming doll artists. But even though the duo behind NiniMomo took some career detours, their OOAK Barbie Dolls are a testament that dolls were their true destination. “If you’re creative and you love fashion, it just falls into place,” says Moronese, a former fashion photographer. He’s the “Nini” in the company’s name—a nod to his childhood nickname. “Momo” is LeBreton, whom he met while the two attended Hofstra University in New York. Collectively, the artists have degrees in photography, biology and healthcare administration—yet it was their shared interest in artistry, fashion and pageants that led them to create NiniMomo more than a decade ago. “We admired their work,” LeBreton adds. “With [Nik’s] degree in art and [because] I know how to sew, we thought maybe it was something we could play with.” While both were employed in other careers, they applied their creative touch to Barbie dolls as a hobby. They never intended for their business to become as big as it has; they certainly never planned on it becoming a career. 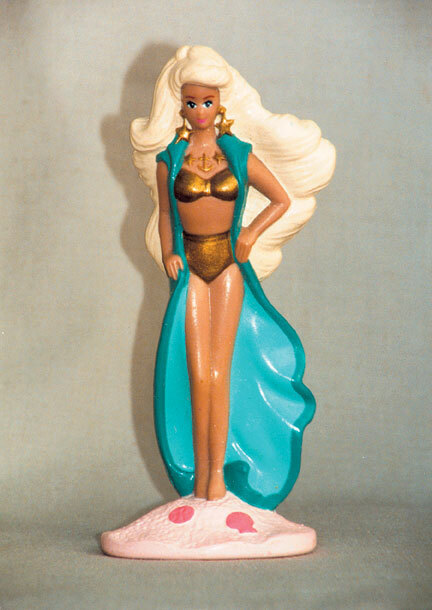 In 1996 they made their first OOAK designs for Barbie—the doll they believed best fit their ideas. For their first show, they brought about 15 dolls and sold half. “This was such a fluke for us,” Moronese admits. One of their first dolls even won Best in Show at a local Barbie show. “Miss Uganda 2008”, formerly “On Location: Milan Barbie,” features a hand-beaded gown, custom jewelry, a full-facial repaint and rooted eyelashes. The original black hair was custom rerooted to a streaked ash brown. While inspiration can arise from many sources, Moronese and LeBreton decided they needed something to distinguish their dolls. “We want­ed to have a cool theme to set us apart,” Moronese says. And choosing that theme seemed to be a no-brainer. The duo had longtime associations with pageants. “I always had an interest in pageants,” says Moronese. “I grew up watching them with my family.” Moronese coached LeBreton in the 1992 Miss New York USA pageant (LeBreton even designed her own gown), and the two are still involved in pageant judging and coaching under Donald Trump’s Miss Universe umbrella (which includes Miss USA and Miss Teen USA). Their creations are part of what NiniMomo calls its pageant collection—in which dolls represent the 50 states, as well as nations around the globe. Barbie dolls are the ideal blank palette for their work, they say. 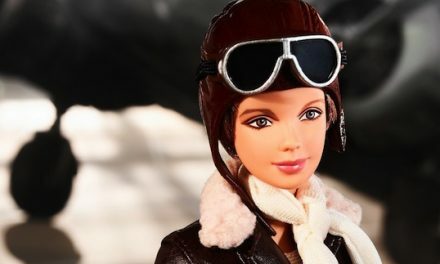 “What I love so much about Barbie now, as opposed to the 1970s, is there’s such a variety of skin tones and face molds. I choose the doll depending on what country we’re doing,” Moronese says. Working from a studio in Moronese’s home, they select a Barbie—anything from pink box dolls to more costly collector dolls—to best represent their vision. They then remove the face paint, repaint the face, reroot eyelashes, and reroot and restyle hair. The bodies remain “as is,” but they are then dressed in NiniMomo’s custom-made ornate and opulent couture. Many of NiniMomo’s designs are their own; some are re-creations based on the works of fashion designers, including Christian Dior and Christian Lacroix. “For me, I like coming up with my own designs,” Moronese says. Their diverse ideas range from the tropical silk evening gown worn by “Miss U.S. Virgin Islands” to the arctic silver dress and cape worn by “Miss Greenland.” Inspiration, they say, comes from many places. “It’s just everywhere,” LeBreton admits. It could come from travel—such as Moronese’s recent trip to South Africa—a shopping trip to buy fabric or even a glorious sunset. “You’re just constantly inspired,” Moronese agrees. Of course, intricate beadwork notches up the quality—and cost—of the dolls. Most NiniMomo originals range from $450 to $800. “I’m proud of the fact that we’re putting out such high caliber dolls,” Moronese says. 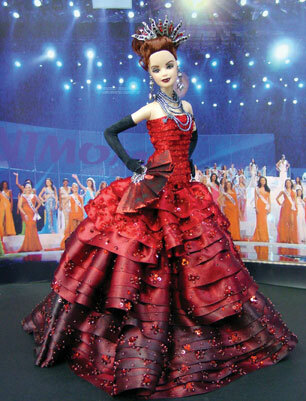 NiniMomo takes pageants one step further by holding “mock” pageants with their delegate dolls. They release and sell more than 200 delegate dolls; the owners of the dolls can then enter them in a promotional pageant. Judges—usually someone involved in the doll world—are chosen to determine the winner from among the 50 dolls selected for the compeitition. It’s a way for the doll owners to fulfill their pageant dreams by vicariously competing and possibly winning the tiara, sash and flowers. Ten years ago, Moronese and LeBreton might still be working in jobs they found unfulfilling—had it not been for the spark of inspiration that hit at that one fateful show. Today, their vision stretches their creativity and inspires pageant dreams in others. For more information on these OOAK Barbie Dolls, visit www.ninimomo.com or call (631) 382-9386.